Right now, you know him as the pink-eyed Olympic news anchor. But, Bob Costas has a legacy that goes far beyond his double-infection of Pinkeye. Thank goodness! He is a sportscaster, yes, and became one in 1974 calling games for radio station KMOX on a show called The Spirits of St. Louis. But the show that made me fall in love with him--professional love, nothing else ;)--is the show Later, which ran on NBC from 1988 to 1994. What I found was a brilliant interviewer who had great wit and insight. 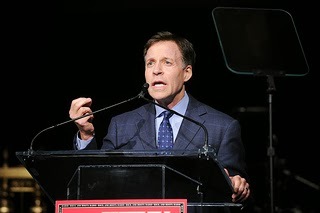 According to Ray Hamel of IMDB, Costas is a "TV sportscaster known as a smart interviewer with encyclopedic knowledge and a devilish sense of humor." Bob Costas is something of a journalist crossed with a therapist. In the video below, at counter number 1:35, he says to Roger Eibert, "Now, you see, that shows a man who's defensive because. . . ."
And, as you can see from the opening quote of this post, he nails the inner motivations of some poor Olympian who didn't cut the muster. For anyone who watches American sports, you know him from his current show Studio 42 on the MLB Network. Even people who don't normally watch sports know him as the primetime host and interviewer for NBC Winter Olympic coverage (and he's done that repeatedly starting in 2002). But, I think of him as beyond the label "sportscaster." To me he is a brilliant journalist, period, and deserves a spot in the NAB Broadcasting Hall of Fame. See Bob Costas Wiki Page; Books by him on Amazon.